FORT DE SOTO BEACH, Fla. — Right now experts are on high alert testing the water outside Pinellas County beaches to see if the toxic red algae bloom impacting Anna Maria Island and areas South will drift North. Despite FWC finding low levels of red tide in two Pinellas County water samples, at Mullet Key and Clearwater Pass, Pinellas County beaches remain red tide-free. Friday, the water on Fort De Soto is aqua blue and the air quality is good. 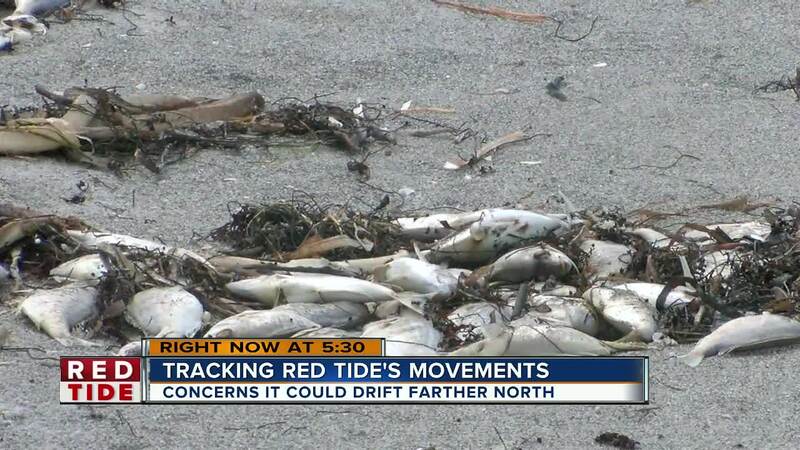 Yet, USF oceanographer Bob Weisberg tells ABC Action News he believes there will be “substantial” red tide in Pinellas County within the next few weeks. Marine experts plan to take samples throughout the weekend to watch how the toxic algae bloom moves. Wildlife experts are praying we don’t see the devastation in Pinellas County that we’re seeing further South. Doctor Heyward Mathews, a professor at St. Pete College's Clearwater campus, has studied red tide for more than 50 years. He says it’s likely this bloom will continue spreading. “There’s a pretty good chance it’s going to start moving up. It may not and it (may instead) go into Tampa Bay, which could be just as devastating," Mathews explained. Once when that happens, “we’re not going to be able to stop it," he added. Mathews says there are a lot of misconceptions about the red tide. He says in his research it isn’t the common culprits, sewage or fertilizer causing it. He points to dust particles from North Africa which contain chelated iron. “In our tests, that's the only thing that caused the red tide to bloom. Whether that’s the absolute smoking gun, nobody knows," Mathews said. Clearwater Marine Aquarium tells ABC Action News they're ready to respond if the bloom moves into Pinellas County. “We’re prepared to increase our efforts," marine wildlife expert Abby Stone explained. As for the weekend, conditions in Pinellas County look good. The latest track has the red tide moving South and wind patterns following suit.